Finishing up the day’s shipment isn’t usually a problem. 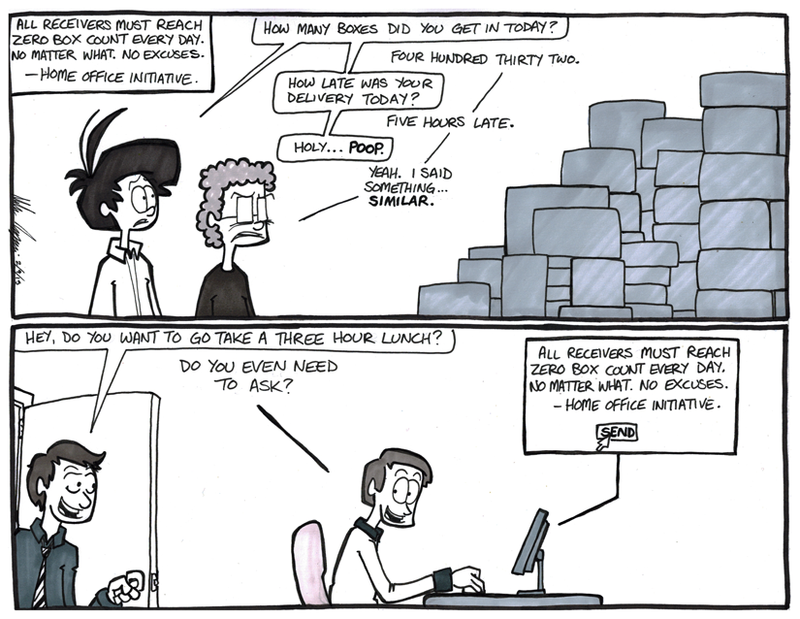 It usually arrives within the delivery window and it usually isn’t a ridiculously unreasonable amount of boxes. So on a usual day a simple home office message about doing what we’re supposed to be doing anyway, opening all the boxes, wouldn’t really draw much ire. It’s on the days where everything hits the fan that can cause blood pressures to rise. Those are usually the day when those home office messages are sent in too. We really have no idea what goes on in The Home Office but it does tend to feel like they’re extremely disconnected from what really happens in a bookstore and how it really is run from day to day. Situations such as the comic above tend to be formed in our imagination as we angrily try to finish a shipment in much less time than needed when we receive messages about how to do our job correctly. Guys, WE KNOW. Do YOU know that not everything runs according to your spreadsheets and numbers and papers and files?